I was just having a book purge, getting ready to move back into my flat later this month, when I discovered a stash of dark novels. Often with supernatural overtones, this genre experienced a mad final fling beginning in the late 1970s before being watered down into new genres, mostly involving adolescent fables of sexual awakening. Many powerful voices emerged from a time when it seemed that every pillar of societal normality was cracking at its base. The best writers were undeservedly lost. Michael McDowell wrote ‘Toplin’, a wonkily unsettling novel so unlike the rest of his work that it was entirely overlooked. Almost all of its characters and settings are in some way deformed and collapsing, as if McDowell had entirely abandoned hope for the future, and this was a tone followed by many others of the period. Charles L Grant was producing his seminal short stories prior to rediscovery via ‘The X Files’, Whitley Strieber was heading for fame with ‘The Hunger’ and ‘Wolfen’, a pessimistic blue-collar take on an ancient lycanthropic legend, and Anne Rivers Siddons delivered a Faulkneresque ghost story set between the old and new South in ‘The House Next Door’. 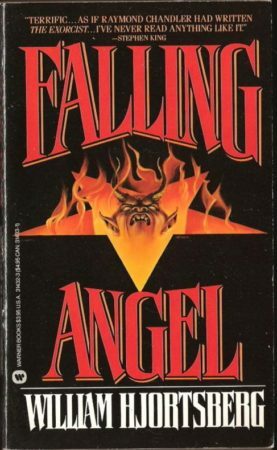 William Hjortsberg wrote ‘Falling Angel’, typical of his upending, disorienting style, one of the few successful hardboiled detective occult mysteries, although his use of a too obvious name for the villain (‘Louis Cyphre’), and Alan Parker’s blunted film adaptation, ‘Angel Heart’, rather took away the mystery. The consistently underrated Tanith Lee began beautifully re-interpreting dark myths and fairy tales, Mary Danby produced ghosts of every imaginable kind and Jeffrey Konvitz imagined the return of Satan through an inner city portal in ‘The Sentinal’ and ‘The Guardian’. There was an apocalyptic feel to this kind of fiction, that we might label the New Disillusionment. Very often evil was allowed to return to earth not because an angel had fallen from grace but because corporate lies and urban hostilities had replaced decent humanity. This was a time when America had suffered the after-effects of Watergate, Kent State, Charles Manson and Kissinger’s Vietnam, and Britain had hit the inept economic nadir of the union-induced three day week. It was also a time when mainstream novelists like Ray Bradbury, Ira Levin and JG Ballard began to explore themes with unprecedented levels of bleakness. In the UK, Ramsey Campbell headed the pack with tales of the hangover from drug culture and political radicalism, while at the lower end James Herbert was providing visceral pulp tales like ‘The Rats’ and ‘The Fog’. Dark fiction could be no longer be guaranteed to provide a safe outcome; the innocent were beset by evils that stemmed from their fellow humans, not just the supernatural. Films followed the trend; heroes could no longer be relied upon to save the day. Sometimes they were assassinated, or proved to be part of the problem. But the New Disillusionment proved to be just part of a cycle; Stephen King presciently helped to hasten its end with his increasingly unfettered optimism, and many of the darkest writers vanished. I love William Hjortsberg’s ‘Falling Angel’. Alan Parker’s film was a bit of a curate’s egg for me. He seemed to want to make it all about voodoo and Hjortsberg’s detective story got lost somewhere along the way. ‘The Wolfen’ was another book which I really enjoyed, but the film version seemed to concentrate more on the horror angle than the idea of a superior intelligence existing on Earth. I understand both films have a cult following these days. I’d agree that Stephen King is usually optimistic, but Revival is a real downer (albeit an excellent read). I read it on holiday in Greece and I had to go for a long run to cheer myself up! Good to see a mention for the much missed Charles Grant. Like Dean Koontz and Lisa Tuttle, he was known more as a science fiction writer in the 1970s, and quite an acclaimed one at that, but went on to make a name in horror. He wrote elegant, evocative prose, but could suddenly kick you in the shin when you least expected it. I’m not sure how much of his work is still in print, but his books are worth hunting down. I remember borrowing Whitley Streiber’s The Wolfen from our local library, on the recommendation of my Dad, who didn’t usually like that sort of thing, but had really enjoyed it. I think Streiber’s career took a bit of an odd turn after he claimed he’d been abducted by aliens. Most the 60’s authors have been lost too, several of them could be glum, John Blackburn and the chilling Charles Birkin, even Dennis Wheatley (who was still big into the 70’s from the 40’s.) seems to have almost disappeared with his stops to rant about the commies interspersed with moments of horror. As the 80’s set off Clive Barker seemed the one to carry on but seemed to go of into a more fantastical world, where in the states Skipp and Spector et al went for the splatter punk, and like it’s musical namesake, it shattered but still lurks round the edges of the genre. In horror there are still grim and interesting authors like Tim Lebbon, Conrad Williams, Simon Bestwick, Thomas Ligotti and many others. I assumed the Guy N Smith title was a malapropism.